How and when should toddlers use technology? What can parents and educators do to build computer skills while ensuring that young child don't get too much "tech time?" Learn what early childhood experts say is appropriate technology use for children ages 2-4, and discover six ways to use technology wisely with young children. Included: Practical tips for using a home or school computer with toddlers and preschoolers, and 16 links to articles and research on technology use in early childhood. 72 percent of first graders use a home computer during the summer. We know that young children are using computers, but should they be? At what age should computer use begin, and what can be done at home and at school to help build computer confidence and competence in children? Below are a few tips for teachers and parents who want to find just the right balance with technology in the home and school. Toddlers and preschoolers learn by doing -- playing in the mud, dressing up, playing house, and participating in other hands-on activities. The National Association for the Education of Young Children advises, therefore, that "computers supplement, and do not replace, highly valued early childhood activities and materials, such as art, blocks, sand, water, books, exploration with writing materials, and dramatic play." In fact, in the report Technology in Early Childhood: Finding the Balance, the Northwest Regional Education Laboratory recommends no more than two hours of "screen time"(computer, TV, and video game time combined) a day for preschoolers. The advice for teachers and parents is clear: Spend a little time at the computer with toddlers and preschoolers, then turn it off, go outside, and have fun in the fresh air. Hundreds of computer games are available for kids from 9 months to 5 years old, so why not select games with educational -- and not just entertainment -- value? Even two-year-olds can begin recognizing shapes and colors and listen to stories read online. The National Association for the Education of Young Children advises that computers be used to supplement -- not replace -- such highly valued early childhood activities and materials as art, blocks, sand, water, books, exploration with writing materials, and dramatic play. Navigation refers to how easy it is for a young child to move around within a Web site -- to play games, follow links, and so on. Although teachers and parents always should supervise computer time carefully, children will feel most successful if they can open, close, and replay their own games and sites with very little adult help. Good Web sites for preschoolers and toddlers rely on images and sounds, rather than on printed text. A green button, red stop sign, or audio prompt saying, "try again" will help most younger users, while a game that has a text message that reads, "Sorry, wrong answer. Press here to continue." might frustrate them. Like simple tools, like Google. Read more instructions than adults. Parents and teachers can help by guiding children to try several times to accomplish a task, to scroll "beyond the fold" (beyond what is initially displayed on the computer monitor), and to recognize and avoid ads and other distractions online. Children can accidentally delete files, send e-mails, change settings, and more. With Windows XP or Mac OS X, parents can create separate user accounts for themselves and for their children. That way, a child, once logged in by a parent, would only be able to access specific files and programs. Password protecting important files (like family budgets, resumes, and so on) also is a solution. Microsoft Office -- as well as other software programs -- has a password tool that can be activated to "lock" a document and protect it from curious kids. Keyboard shortcuts (combinations of keys like Control and P to print) often can be pressed inadvertently by growing hands, starting programs up, shutting them down, and causing other mischief. So, consider purchasing such software programs as Jump Start Baby or Reading Rabbit Playtime for Baby and Toddler, which have activities that reward keyboard pounders and multiple key pressers. Learning about computers doesn't need to break the family bank. With just the Internet and a home computer, families can play math games, read stories, and visit faraway places without spending an extra dime. Even older computers that don't have the Internet have word processing and drawing programs. Use those programs for fun activities, such as "Finish the Story." Read aloud a picture book to the child, but do not read the last page. 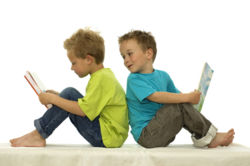 Then ask the child to illustrate, type, or narrate an ending (depending on the age and skill level of the child). In addition, many public libraries have computers available for public use at no charge. (If possible, avoid the 3-5 p.m. after-school crunch.) Community centers and houses of worship are other good possibilities for families without computer access at home. By limiting computer time, focusing on educational and easy-to-navigate activities, and by simply sharing the time with their child, parents can help toddlers or preschoolers build a foundation of success and skills for the years ahead.